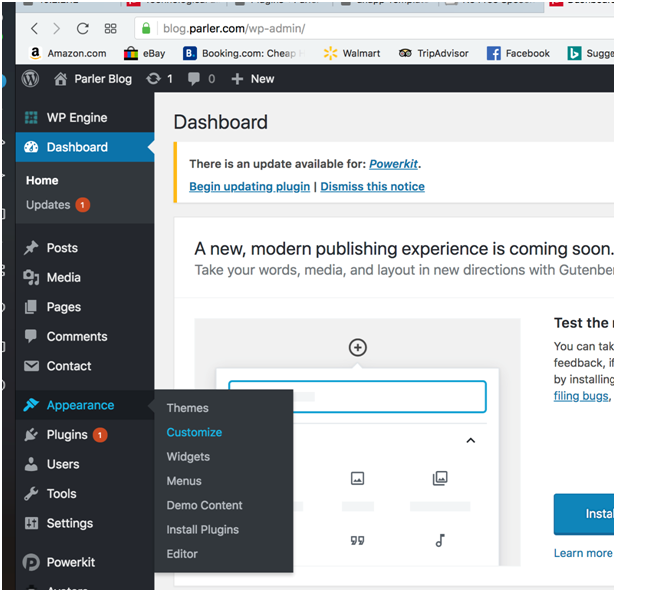 Click the Wordpress tab to install the plugin on a Wordpress site. Click the HTML tab for custom plugin install. The following will guide you through the Parler WordPress Installation Process. Navigate to your WordPress Admin Page. Under the plugins tab in the Wordpress sidebar menu click "Add New". From there type "Parler" into the search field. Find the Plugin titled "Parler For WordPress" and click the "Install Now" button. Once it's finished installing click activate. 2) Retrieve API key for Plugin. If you see “Integration Complete” then you are done setting up the plugin. If you see issues with verifying your domain, you may need to create a file in the root of your domain and place a hash string in it to authorize your domain name. If you would like you can also activate the widget to move the comments to a different location on your site. Note that activating the widget will deactivate your default comments location. Enjoy your Parler Commenting Plugin! The following will guide you through the Parler HTML Installation process. The Parler commenting section should now appear on all posts. 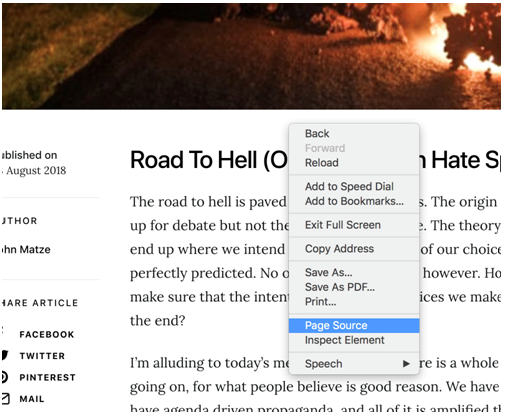 We should double check by navigating to an article, viewing the page, and pressing Cmd-R (Ctrl-Shift-R for Windows). 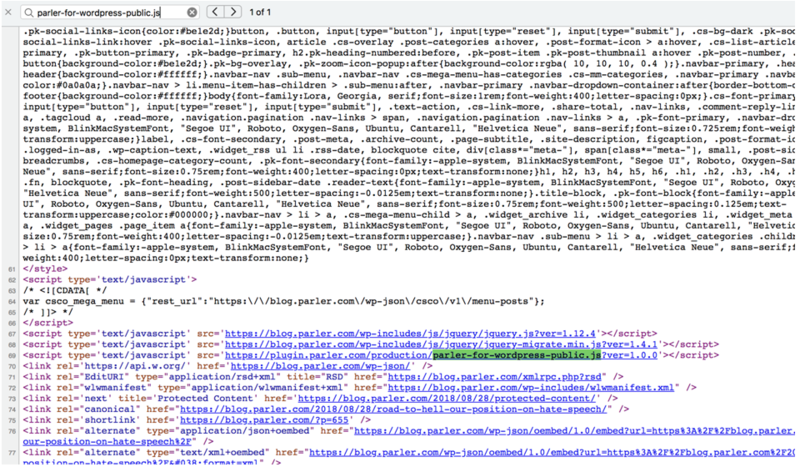 When viewing the page source, press Ctrl-F and search for word “parler-word-wordpress-public.js“, and “parler-for-wordpress-public.css“. Ensure both of these files exist. The Plugin should now be completely installed. Method 1: Confirm with Parler that we have verified your site. 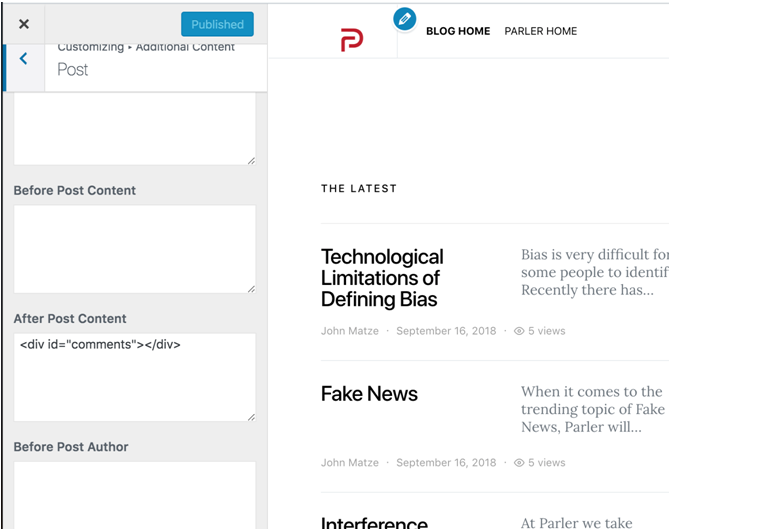 If you have recently installed the Parler Plugin and it isn't showing up in the comments section of your site then it might be that we haven't yet verified you site in our server. If you would like to confirm please send and email to support@parler.com with the site you would like confirmation for and (if you have it)the associated Parler account info. If the commenting section now appears on your site, you do not need to continue. Navigate to the ‘Customize’ section, and you may find various settings on the left side of the page. Find an area in your page that makes the most sense to add a vid or p tag with the id=”comments” inside of it. Then select Publish. 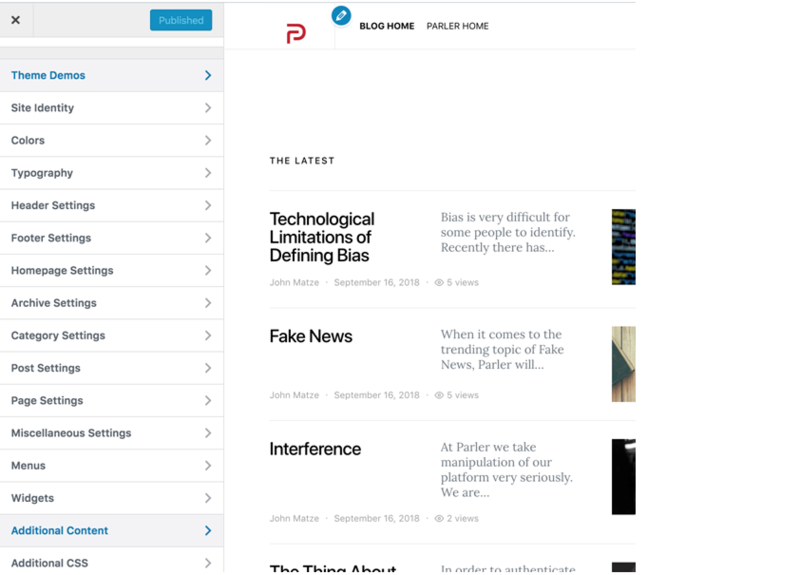 If you still don’t see the Parler commenting plugin on your site, please email ‘support@parler.com’. Copyright © 2018 Parler Plugin – Powered by Customify.